Puzzle games used to be a simple genre with a simple idea. You solve puzzles for time killing enjoyment. However, the genre ballooned in a big way on mobile. In fact, it’s one of the most popular genres on the entire platform. It started with simple viral games like 2048 and evolved into genuinely enjoyable experiences like Monument Valley and Telltale Games titles (until they went under). These days, you can find some seriously good puzzle games on Android and iOS. Gone are the days of super simple mechanics and graphics with goofy ideas. Some of these games are actually fairly intense and complex with stories and even really good graphics. Here is one of the best puzzle games for Android and iOS - Xcube Master. 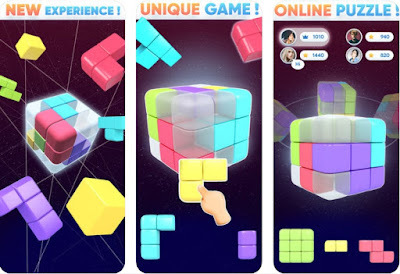 Xcube Master is a highly innovative 3D cube puzzle game, full of fun features and awesome design. It is both entertaining and brain-challenging, suitable for players of all ages. So if you want to enjoy a totally new puzzling experience on your device, anywhere and anytime, this is a great choice for you. In addition, the graphics are colorful and upbeat, and the controls super-smooth. With a challenging gameplay, the Xcube Master game will certainly tease your brain and make you think. The main goal is destroy lines of different shapes. There is a fully rotatable 3D cube that you need to rotate in order to place the different shaped puzzle blocks at the appropriate places to create a line and destroy it. As you can see, this is a unique take on the classic cube games. Create and clear as many lines as possible to earn the highest scores. Compete against other worldwide players with the Multiplayer option, play in leagues and see if you can be the number 1 player. Use powerful power-ups for help in your gameplay, collect points and diamonds and unlock new features. Customize the whole theme of your game by picking from various options and win cool rewards each day. With these, and a lot more awesome features, Xcube Master can be downloaded for free from the App Store and from Google Play.